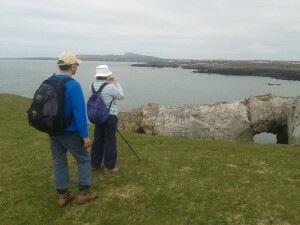 !0.30am – 1.30 pm, this one of the most popular walks with stunning coastal scenery, amazing geology and varied wildlife. Lots of history too with St. Gwenfaen’s well and Tyger’s grave. At this time of year there are lots of wildflowers to see and learn about, also nesting shag and lots of chough. We regularly see seals on this walk. Moderate walk with some rough ground, hills and cliffs.